Why I like to draw, leads into looking at travel sketches of other artists. To record the world around me. Looking and drawing a scene imprints it more than a snap which can be taken with even looking. The drawing is the cumulation of the experience of being in a place for a period of time. Quite often some of my more developed sketches may take 45 -60 minutes. This impression and expression of the scene gives a lasting memory, and life is nothing more than a collection of memories and experiences. Drawing allows you to see a scene more completely than a look. I have noticed the mis-matched windows in a dormer when looking to draw, this would pass unseen along with many other details if not looked at to be drawn. 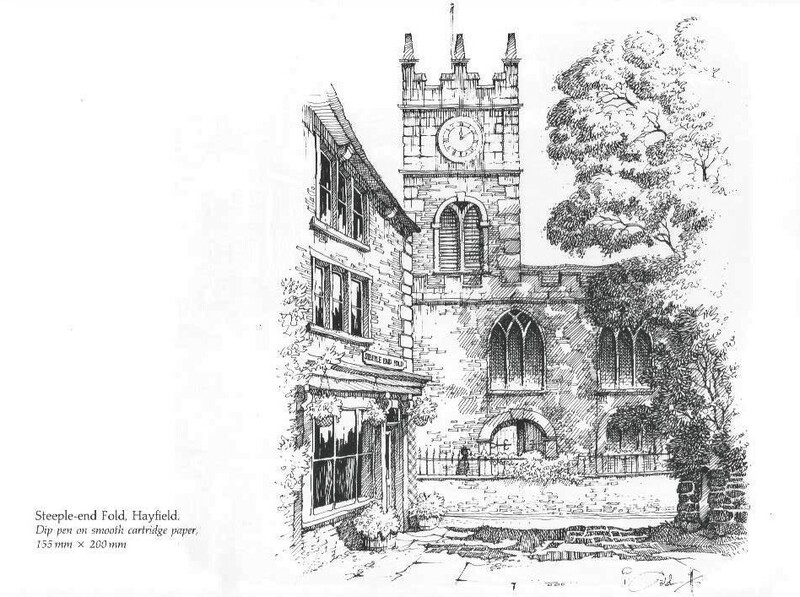 Tunnicliffe’s drawings are figs 0-1 -0-5 below and Caldwell’s are numbered 0-6 to 0-10. 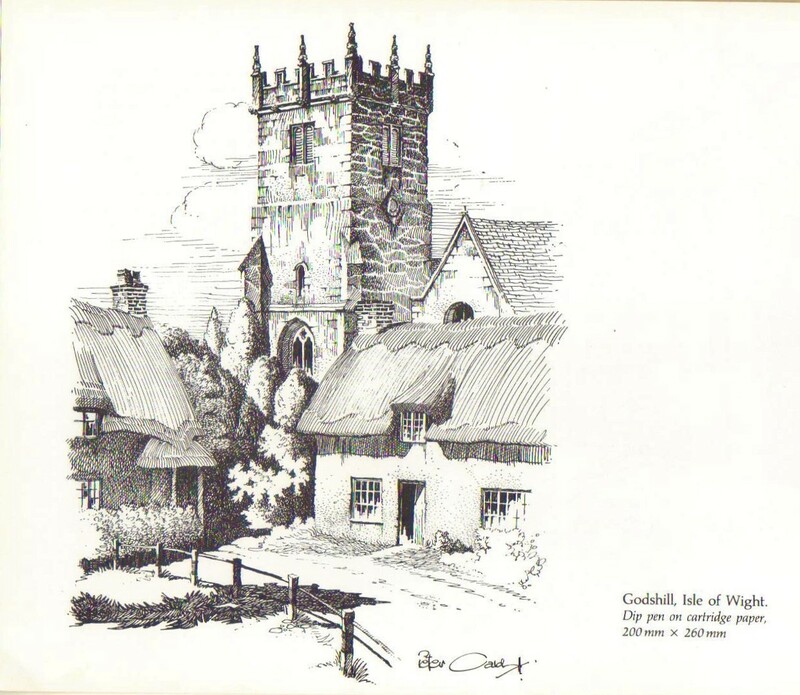 In addition to Tunnicliffe I was also drawn to the word of Caldwell. This was a good basic primer in various aspects of drawing such as composition, perspective, tone and mark making. I was also drawn to the subject matter of Caldwell. 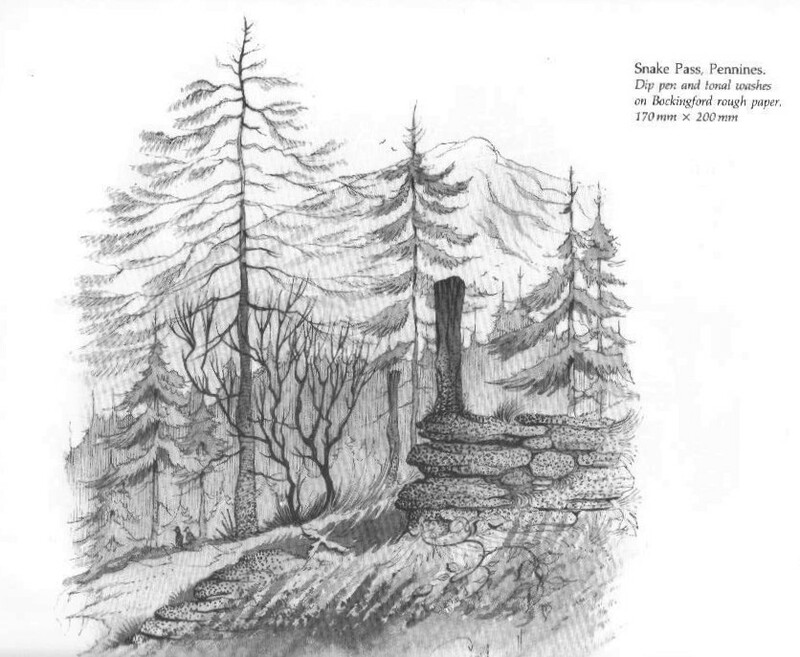 This is also mirrored in some of the subject matter in my own sketchbooks of my travels. Caldwell worked in ink primarily and this is the medium I like best for working in. Dip pen (steel nib, bamboo etc), fountain pen, biro and gel pens etc. are the drawing implements I prefer to work in; this is clearly shown in my various sketchbooks. (Caldwell, 1993). Another inspiration for me in drawing is van Gogh. Though he is not necessarily the most proficient or natural draughtsman he showed what can be achieved through sheer perseverance of effort. He showed that through a vocabulary of mark-making using marks individual to him he could give a quick rendition or movement, texture and form using only the most basic of tools: ink, paper and reed pen. I will look more closely at Van Gogh later in the research of this ‘Parallel Project’. In this Parallel Project I will look at the travel sketches of artists such as Delacroix, Turner, van Gogh* plus others. (* will thus link to the critical review work). Delacroix, Turners etc all travel and drew extensively on the road. These drawings were to record their visits, what they saw, references for future works and to develop their own voice and skills. Over the last year and going forward I have travelled several times and I utilise a sketchbook on my travels. Usually I record an image from a plein air drawing at the scene. Where this is impossible due to time, weather or physical constraints I either do the drawing in its entirety later or complete an already commenced drawing. Below are noted some artists whom kept travel sketchbooks on their journeys. For some (or all) I will note some examples and analyses their work and how I can utilise aspects of these in my own practise. I will look at their sketchbooks, materials, methods, styles and mark-making to analyse and compare how each may have worked. I will look to see what aspects of their work I may be able to utilise in my practise by distilling their practise and identifying aspects I can use in my own work. 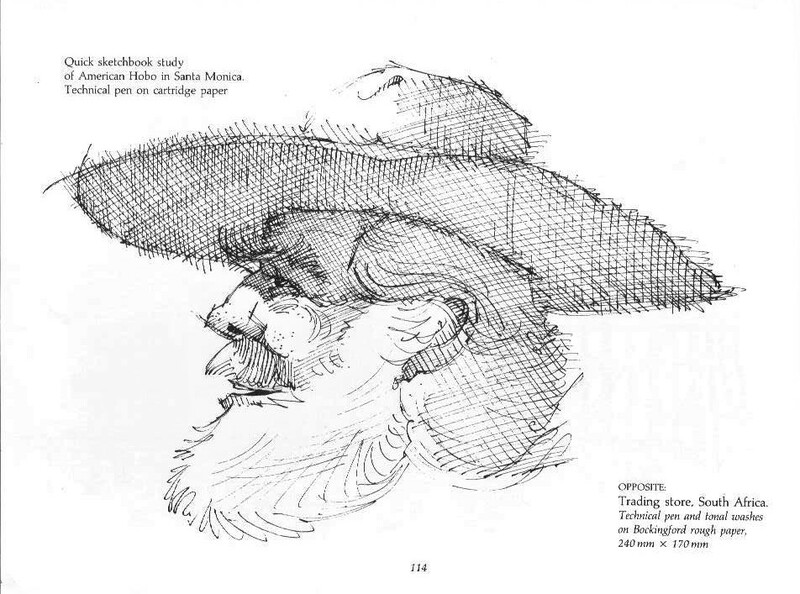 Some aspects of this have links with the Critical Review of this course – Investigating Drawing. The artists I will examine are a range of styles, eras, fashions, methods and materials. I will write a research blog for each of these artists separately. “Even in the age of the photograph, watercolour could suggest an alternative way of looking at the world and in the twentieth century artists such as Mackintosh, Ravilious and Procktor continued the tradition of responding to the spirit of place” (Tate. 2018). Fig 0-1. Tunnicliffe, C.F. (1979), Page 50, Tunnicliffe, C. (1981). 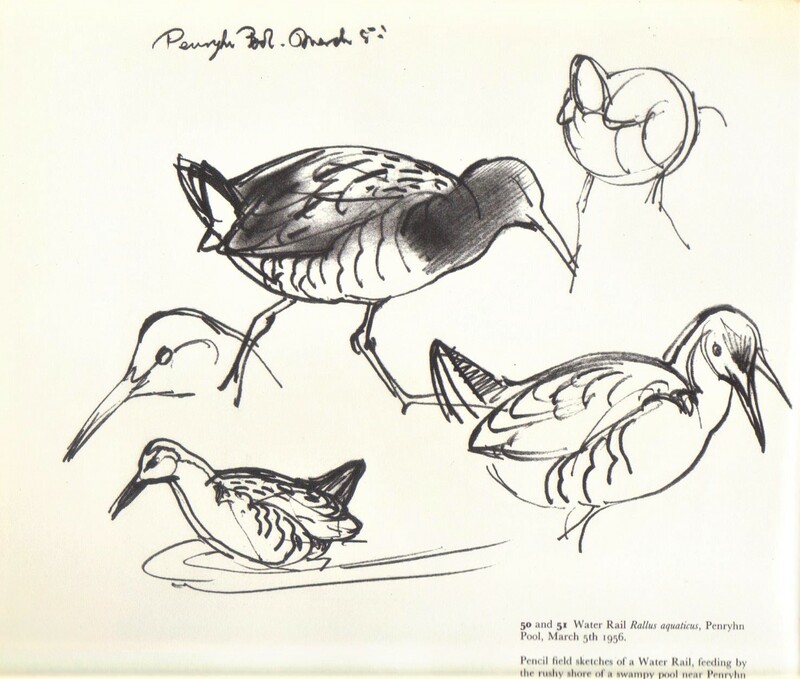 Sketches of bird life. London: Victor Gollancz. Fig 0-2. 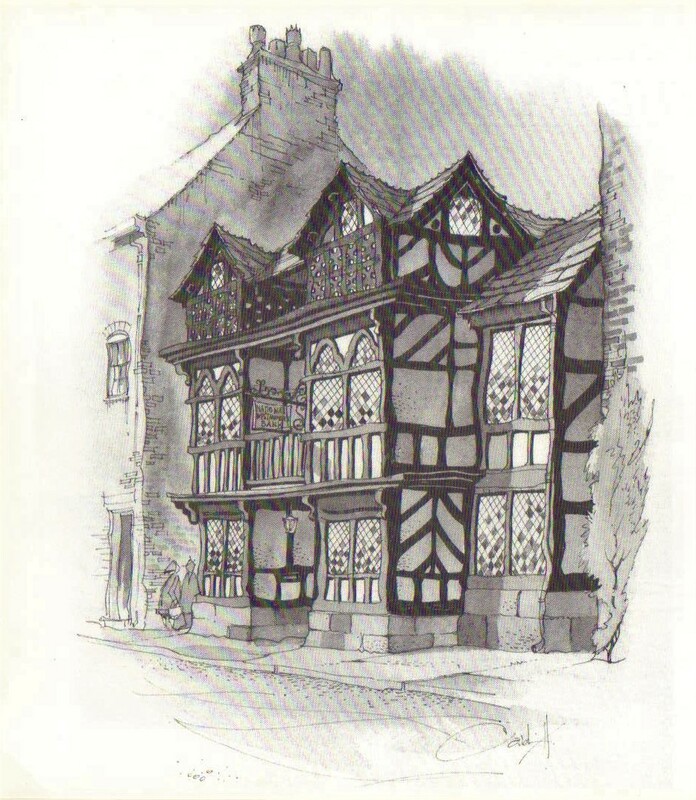 Tunnicliffe, C.F. (1979), Page 42, Tunnicliffe, C. (1981). 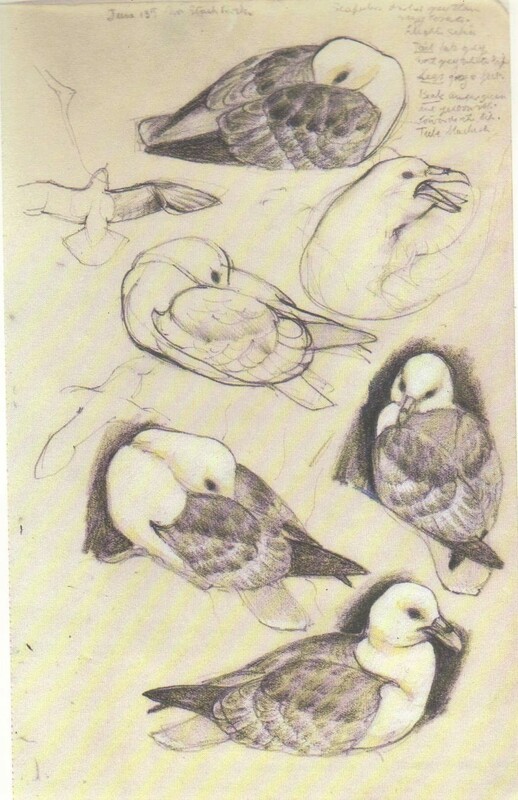 Sketches of bird life. London: Victor Gollancz. Fig 0-3. Tunnicliffe, C.F. (1981), Page 40, Tunnicliffe, C. and Niall, I. (1979). A sketchbook of birds ; introduction by Ian Niall. London: Gollancz. Fig 0-4. Tunnicliffe, C.F. 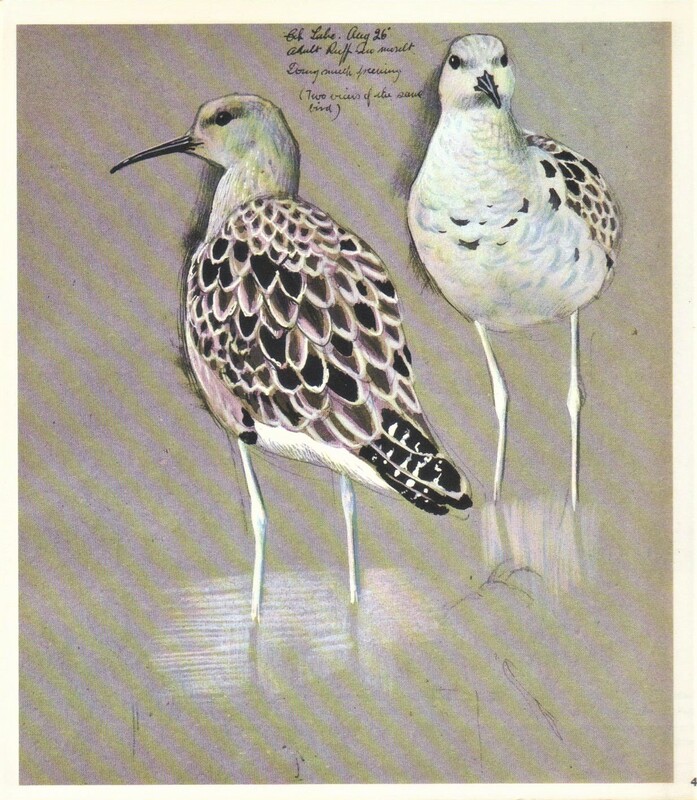 (1981), Page 6, Tunnicliffe, C. and Niall, I. (1979). A sketchbook of birds ; introduction by Ian Niall. London: Gollancz. Fig 0-5. Tunnicliffe, C.F. 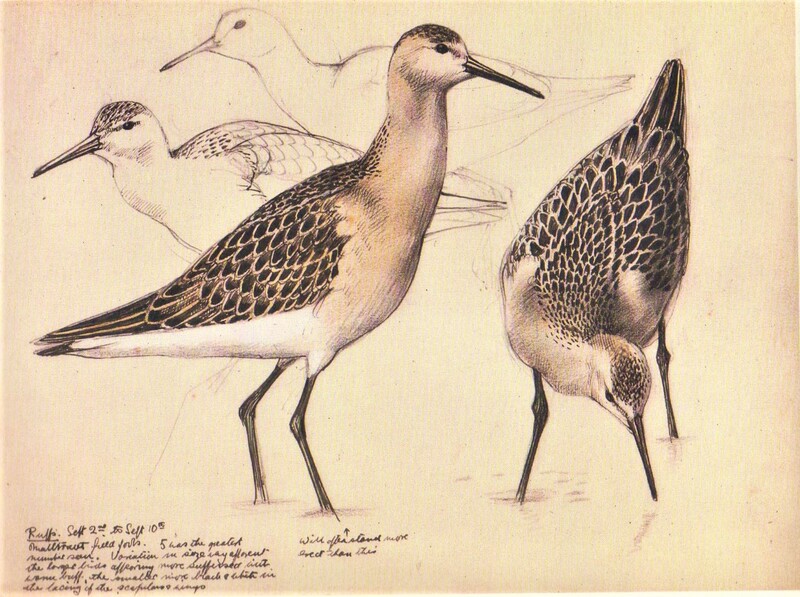 (1981), Page 42, Tunnicliffe, C. and Niall, I. (1979). 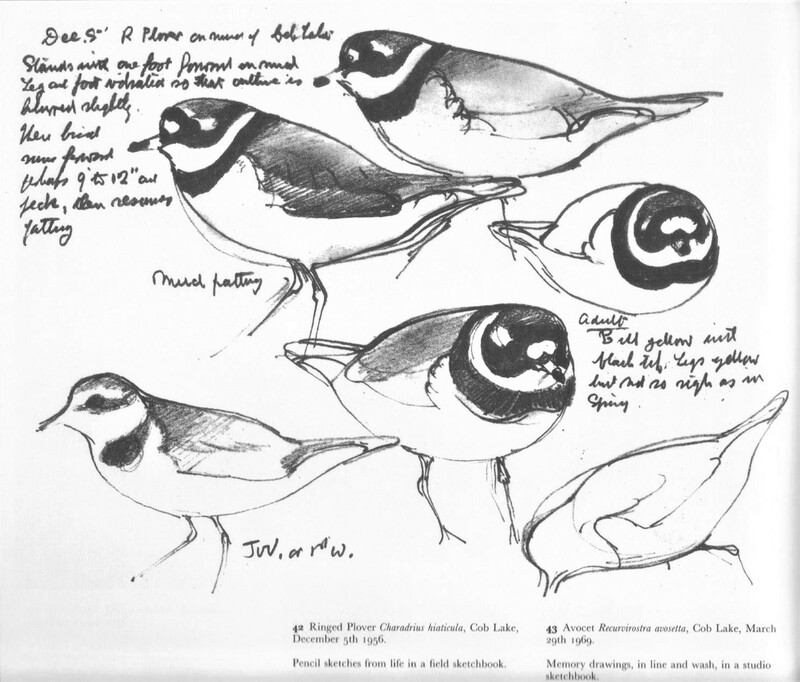 A sketchbook of birds ; introduction by Ian Niall. London: Gollancz. Fig. 0-6. Caldwell, Peter. (1993), Page 35, Caldwell, P. (1993). Pen & ink sketching. London: B.T. Batsford. Fig. 0-7. Caldwell, Peter. (1993), Page 34, Caldwell, P. (1993). Pen & ink sketching. London: B.T. Batsford. Fig. 0-8. Caldwell, Peter. (1993), Page 32, Caldwell, P. (1993). Pen & ink sketching. London: B.T. Batsford. Fig. 0-9. Caldwell, Peter. (1993), Page 120, Caldwell, P. (1993). Pen & ink sketching. London: B.T. Batsford. Fig. 0-10. Caldwell, Peter. (1993), Page 114, Caldwell, P. (1993). Pen & ink sketching. London: B.T. Batsford. Caldwell, P. (1993). Pen & ink sketching. London: B.T. Batsford. Tate. (2018). Watercolour room guide: travel and topography | Tate. [online] Available at: http://www.tate.org.uk/whats-on/tate-britain/exhibition/watercolour/watercolour-room-guide/watercolour-room-guide-travel [Accessed 2 May 2018]. Tunnicliffe, C. and Niall, I. (1979). A sketchbook of birds ; introduction by Ian Niall. London: Gollancz. Tunnicliffe, C. (1981). Sketches of bird life. London: Victor Gollancz.